The Buzz: Gotta Love that Sandy Allnock! Gotta Love that Sandy Allnock! Hello Friends! Happy Sunday! I wanted to share something fun with you. 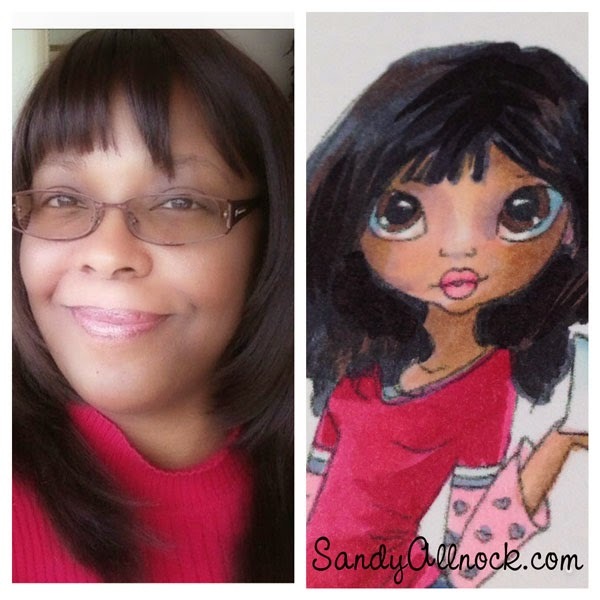 A few weeks ago, sweet Sandy Allnock the very same one from Operation Write Home, who also happens to be an AMAZING Copic colorist, posted on Instagram that she wanted to do a color-match with ethnic skin tones. I posted my picture and lookie, lookie! Isn't that cool?! There are many more examples on her Gimme Some Skin post. Sandy searched for images that looked like each pic and then made her samples. And guess what? Each of the people that she selected to color match, will receive the image that Sandy colored to match them! The image she used for me is called Love Letters. She's a digi from Saturated Canary. I just love how this turned out and I look forward to receiving my color matched image. Just in case you're interested...these are the Copic colors Sandy used on this image: E00 E33 V93 R11 R000 If you've ever had a challenge, like I have, with ethnic skin tones, you have to check out Sandy's post, because all of the other color combos are listed there, as well. That's it for me today. I hope you are enjoying your weekend! Wow! How neat! I love the coloring she did. I also love that photo of you. You are so pretty. :) Have a great week. Sandy did an amazing job, Barb. Thanks so much for sharing the beautifully colored picture. What a kind and sweet blessing for you to receive.